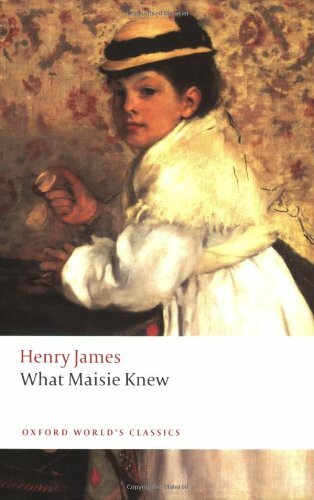 For my April book of the month (January, February, and March here), I chose a classic rather than a contemporary novel, Henry James's What Maisie Knew. There's a movie that is a modern reinterpretation of the story coming out soon, and I wanted to read the book first. The novel is about a little girl who is dealing with the divorce of her parents and their subsequent relationships, which was a rather radical topic for the end of the nineteenth century. Maisie, the little girl, is essentially abandoned by her narcissistic parents, and is shuttled back and forth between parents, stepparents, and other guardians throughout the novel. The book explores the question of how much a little girl can understand of the very adult actions taking place around her even as she grows and matures more quickly than any child ought to. The ending, in typical Henry James fashion, is rather bitter, but the story is wonderfully told. I've heard that the movie, which starts Alexander Saarsgard and Julianne Moore, among others, doesn't tell the novel all the way to the end (which opens the possibility of a rather happy ending), and from the trailer, it looks charming and so, so sweet. I can't wait to see it!